Meg Whitman guilty – of IRS fraud? Much attention has been raised by Gloria Allred’s client, Nicky Diaz Santillan, and the “case” she may have against her former employer, Meg Whitman. This aspect of Meg Whitman’s relationship to her ex-housekeeper is full of sound and fury, signifying nothing. It misses the point entirely, as does most of the media (on purpose). What is significant, however, is Meg Whitman’s possible violation of IRS, federal, and state law. If Meg Whitman’s ex-housekeeper was her employee, Ms. Whitman would have to file many reports—including IRS W-2 statements annually, SSA W-3 statements, along with state forms. If the ex-housekeeper was a part-time contractor, Meg Whitman would have to submit an IRS 1099, so either way there is a problem—for Meg Whitman. Given this fact, it is difficult to believe that the authorities would not have bounced incorrect forms with a questionable social security number back to Meg Whitman. Did Meg Whitman “miss” all of those letters, as well as the one she claimed to have missed (with her husband’s handwriting on it)? If Meg Whitman failed to file properly, there are penalties—some of them quite severe. If she failed to file—it is even worse. In either case, what Meg Whitman did was wrong. This has nothing to do with the possible civil suit coming from her ex-employee—it is far more serious for Meg Whitman, as it involves the IRS along with other federal and state authorities. Below are the basic requirements which Meg Whitman, as former head of eBay, should certainly know. 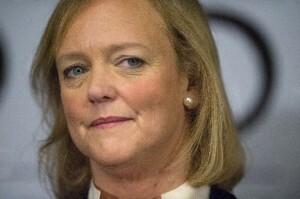 Meg Whitman should also know not lie to the public. You may need to do the following things when you have a household employee. When you hire a household employee: □ Find out if the person can legally work in the United States. □ Find out if you need to pay state taxes. When you pay your household employee: □ Withhold social security and Medicare taxes. □ Withhold federal income tax. □ Make advance payments of the earned income credit. □ Decide how you will make tax payments. By January 31, 2011: □ Get an employer identification number (EIN). □ Give your employee Copies B, C, and 2 of Form W-2, Wage and Tax Statement. By February 28, 2011 (March 31, 2011 if you file Form W-2 electronically): □ Send Copy A of Form W-2 to the Social Security Administration (SSA). By April 15, 2011: □ File Schedule H (Form 1040), Household Employment Taxes, with your 2010 federal income tax return (Form 1040). If you do not have to file a return, use one of the other filing options, such as the option to file Schedule H by itself.